This year’s artist shirt is designed by Sam Wiehl and features a small, pocket-sized front image and a full-sized image on the back. Sam is a British graphic artist and designer who we met during a KFJC remote broadcast from the Liverpool International Festival of Psychedelia, of which he is a partner, curator and creative director. He produces artwork for both the Liverpool festival and the Eindhoven Psych Lab, and plays drums in festival favorites Bonnacons of Doom. 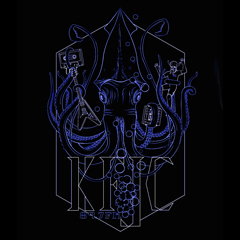 He is deeply immersed in the Liverpool music and arts scene, and we were thrilled when he agreed to design a t-shirt for KFJC’s 2016 fundraiser in his characteristic style. 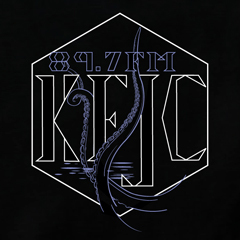 The KFJC Artist Series T-Shirt is available on a black, 100% cotton shirt as our thanks for your generous donation of $45 or more.